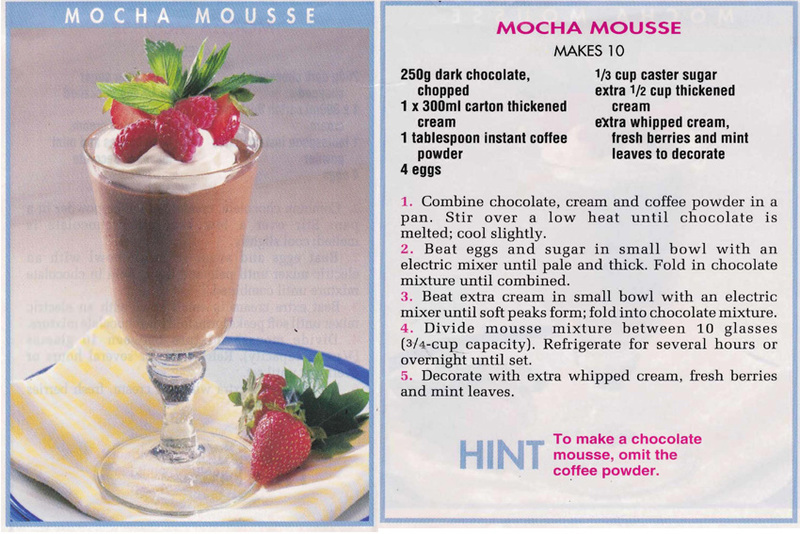 I usually make Chocolate Mousse in one large bowl and then serve it up with berries, but this recipe makes 10 individual desserts. Great for a large dinner party, especially as it can be made the day before. Long ago Mum gave me the recipe for homemade lemon butter, it was always a favourite when the lemon tree was producing lots of fruit. Nowadays it’s a lot easier to just buy a jar at the supermarket – doesn’t taste as good though. 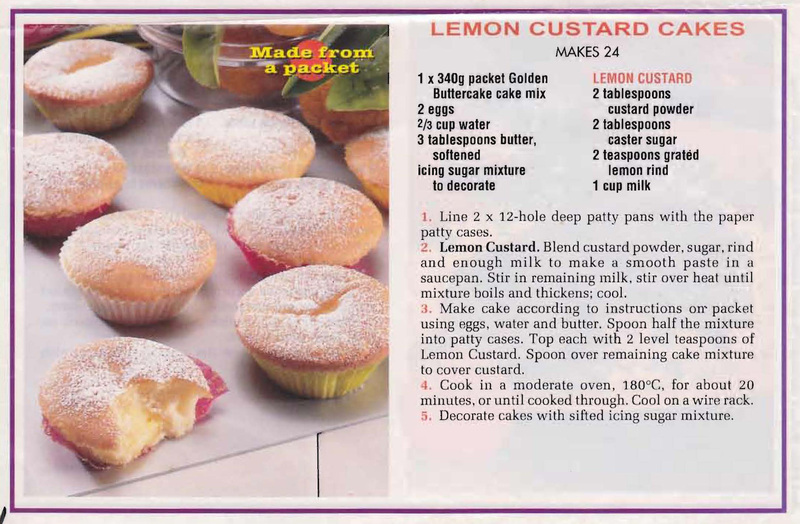 So for this recipe if you’ve got the time, and the lemons, you can use homemade, but if not go with the bought variety. 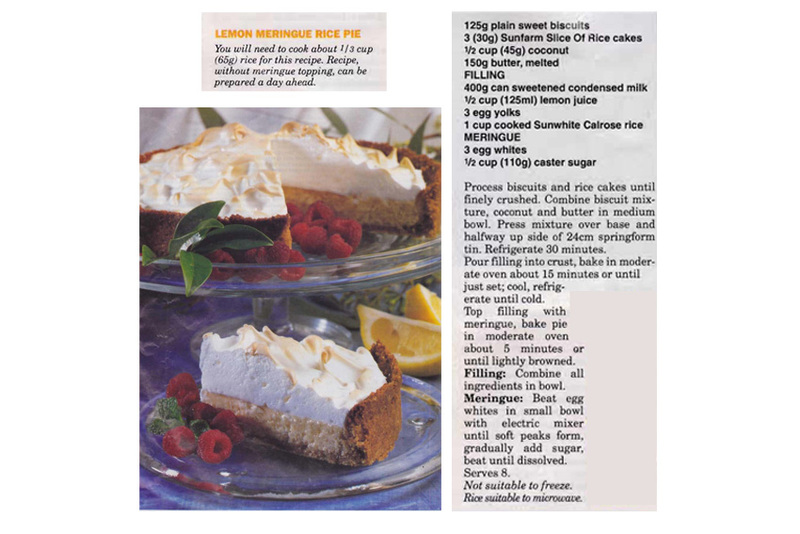 I would never have imagined that you could use rice cakes to make the base of a lemon meringue pie, but this recipe from Sunrice Australia published in the Women’s Weekly does just that. In the picture the base looks quite good, it does have some crushed biscuits in there as well as coconut, so I guess it works and the filling has rice in it as well. It’s certainly a different lemon meringue pie!! With most shortbread recipes you rub the butter into the flour and then add the other dry ingredients which takes a little bit of time. 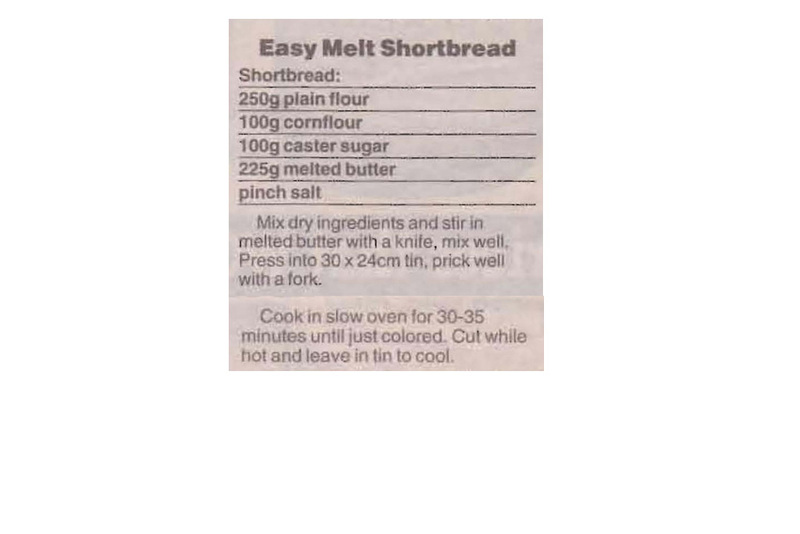 Melting the butter instead is certainly an easier option and a whole lot quicker, not traditional, but quicker….. 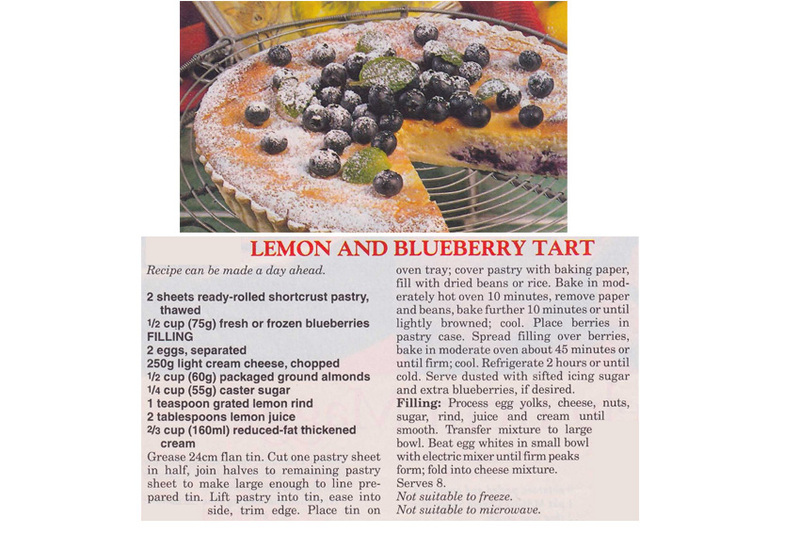 I haven’t made this Lemon and Blueberry Tart yet as I’ve only just found the recipe in Mum’s collection. It looks great though and pretty easy to make. Because it uses frozen blueberries you can make it all year round, so I think I’ll try it out for our next family get together. 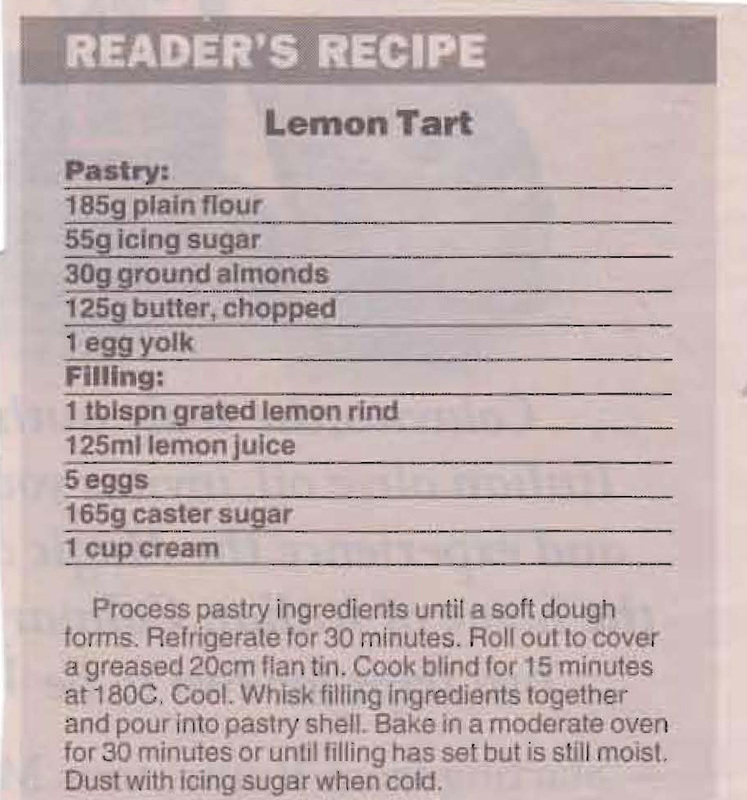 I’ll admit that sometimes when I don’t have a lot of time to spare I buy a lemon tart from my local cake shop, but this old recipe of Mum’s reminds me that making your own isn’t all that hard. The advantage of making it yourself is that you can give it a bit more lemon flavour, bought ones are usually a bit sweeter and don’t have that real lemon kick. This is another of Mum’s finds in the Woman’s Day. To be honest I can’t imagine her ever buying and using a packet of cake mix, she’d have made the cake from scratch. She made cupcakes and butterfly cakes that way so I’m sure she’d have done the same for these.